Enjoy our sauna and spa! Hi guys! Well, first of all, get those backpacks of your sore shoulders and crash down in one of our comfy hammocks. Swing softly on the hypnotizing background sound of the crickets and funky beats coming from our restaurant and bar. 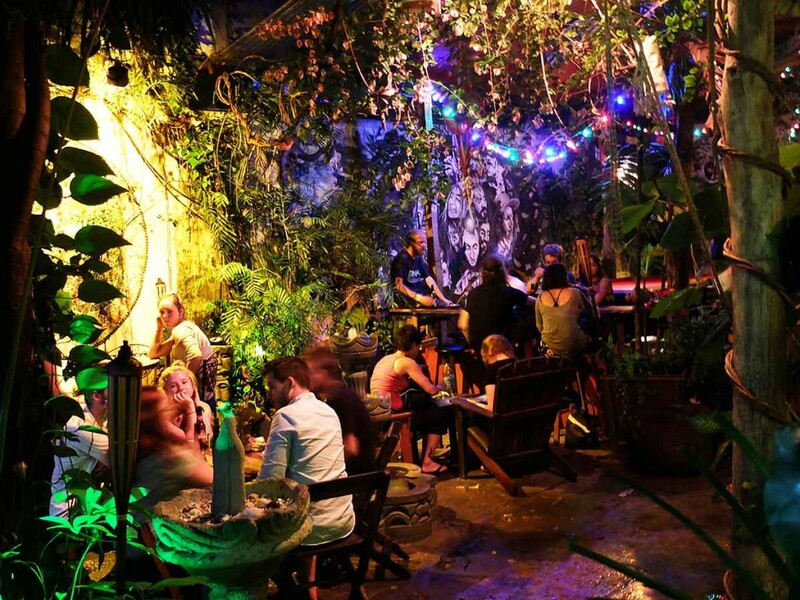 Or have a healthy, refreshing drink in our lush jungly garden. This is what Los Amigos is all about. Chilling and feeling at home. Having these random encounters with other backpackers is what made my own travels magic. That is why we tried to turn Los Amigos into more than just another stop on your trip. More than just a cheap sleep or anonymous place to stay… Rather a place to be. Los Amigos was not only build by us, but also by you! Excelente atención, comida y ambiente! Toda una experiencia. Me encantó Guatemala y su gente. 100% recomendado! Hasta Pronto! What I would describe as the perfect hostel. Keep up the good work! Super friendly staff! Fantastic hostel! Made my first impression of Guatemala one to remember. Great food, chill vibes! Enjoyed this hostel very much. Will come back someday soon! Bring family and friends! Lived up to the hype. Thanks for a great stay! Before coming here we’d heard tons of stories about this place. When we arrived it was great to see all the stories were true. We really enjoyed our stay here. Thanks a lot! This is an exceptional place! Warm, well maintained and with a truly awesome staff. Muchas gracias! Thank you for a great stay! Loved the inspiration zone, crazy good showers, lovely staff and great, reliable travel advice. We gon´ miss your showers and fish fillet. Great vibe, people and food. Best hostel I´ve stayed to date. Wish I could have stayed longer! Muchas gracias! Had a great short time at Los Amigos. Staff is great and friendly and it’s an excellent place to meet fellow travelers and, of course, party! Hope to make it back some day. This is by far the best place I’ve ever stayed at. Much better than a hotel and I feel like it’s the only reason I would come back to the country. Thanks to Los Amigos for making it possible for me, and those like me, to travel the world and feel welcome. Trying to balance service and affordability cannot be easy but you guys do it very well! Love it here! Thank your for what you are doing! Super clean, safe, great vibe. The main bar has an awesome area to chill and meet people and they have another bar upstairs to continue on later at night. The food from the restaurant is unbelievable. Massive portions and really cheap. Beautiful place to stay. Great atmosphere, lovely food and great for tours. The staff are lovely, really friendly and smiley. The rooms were really cool, like staying in a treehouse. Definitely recommend staying here! Absolute gem of a hostel! Loved this hostel, really comfortable room and the bar has some lovely food. All the staff are really relaxed and so helpful when it came to organising our trip to Tikal and Lanquin. Wow! Absolutely loved this hostel! Great prices, great food and the bar staff were fantastic. It was the perfect mix of party and relaxation with a lot of hammocks and a great common area! Highly recommended from me! What a great time I had in Los Amigos! The Tikal tour was fantastic, the food in the restaurant was great, the back room for late-night partying was legendary and the atmosphere was perfect. Best place in Flores! It’s a great place to stay, good food and awesome bar! I must say it is the best bar to hang out in Flores. The rooms are nice and clean. You also have their travel agent who offers great deals for tours near and far from Flores. Best decorated hostel I have been in. Great common area layout, real backpackers hub, clean beds and room, good value. Good restaurant and one of the only and best nightclubs on the island. The most relaxed place in town. This is what all hostels should be like! Excellent restaurant on site. The best food in town, if not the entire country. When you walk in, you wonder if this is where travellers go when they die! It’s paradise, from end to end! Backpacker’s paradise! The friendly owners can help you plan your travels to other parts of Guatemala. Flores one true hostel!! Offers all the traveler’s perks. Head here for good info. I highly recommend staying in Los Amigos, which is still one of my top favorite ever hostels for atmosphere. Flores´ cozy backpackers meeting point to share a drink with like minded travellers and enjoy a huge tasty meal! We serve delicious vegetarian dishes and organic juices and yummie burgers and steaks for the meat eaters! We have a wide variety of accomodation at Los Amigos. From the good old dorm (with hot showers) to luxurious artistic private rooms with airconditioning and private bathroom with hot water. Ahhh. All those long hikes and treks and walking around with heavy backpacks eventually take their toll on your backs! Try our relaxing herbal eucalyptus steambath or a therapeutic shiatzu massage.